These notes have been prepared for those who are not chemists. Chemical symbols are used sparsely, and only as additional information for chemistry buffs. This account does not cover the manufacture and use of dolomitic lime, which is quite a different story. If lumps of limestone are heated to a temperature in excess of about 800oC, carbon dioxide is driven off and what remains is quicklime, calcium oxide. The process is called ‘calcination’. If calcination is carried out correctly the lumps of quicklime are approximately the same size as the original lumps of limestone but much less dense, because of the weight loss of 44% arising from the removal of carbon dioxide. If a precisely controlled amount of water is added to quicklime, a (violent) reaction ensues with much evolution of heat. In the chemical reaction with water the lumps of quicklime break down to a dry fine white powder known as hydrated lime or lime hydrate. If excess water is added the lime is said to have been slaked and the outcome is a slurry or paste of hydrated lime, such as might be used for lime-washing a wall or for spreading on acid ground to reduce acidity and improve soil structure. Quicklime was also spread directly on the ground and in the eighteenth century its use was often a requirement set down in farm leases. It was also used for the disposal of hanged bodies in gaols. Modern uses of quicklime and hydrated lime are outlined in Chapter 4. Lime mortar consists of a mixture of hydrated lime, sand (and/or other fine grained material such as coal ash) and sufficient water to make a workable paste. It hardens through the reaction of hydrated lime with atmospheric carbon dioxide. Calcite, which is the principal constituent of limestone, is the outcome of this reaction. Hardened lime mortar can be considered to be man-made sandstone with a limestone binder. Without access to atmospheric carbon dioxide the lime mortar paste will not harden. Lime mortar used in foundations would not have access to atmospheric carbon dioxide so, prior to the invention of Portland cement, foundations were often built without a binder to hold the stones together. Lack of sound foundations has been the cause of structural problems in many medieval cathedrals. Today’s Portland cement, invented in the 19th century, is quite different as it achieves its strength through a chemical reaction with water and is eminently suitable for use in permanently damp conditions. If you purchased slaked lime it would be delivered as ‘lime putty’, covered by water to prevent premature hardening by reaction with atmospheric carbon dioxide. You could also make your own lime putty by mixing hydrated lime, purchased from a builder’s merchant, with water. Dry hydrated lime in a paper sack reacts only very slowly with atmospheric carbon dioxide and so has a long shelf life. Lime putty was used extensively for plastering, often mixed with dung and with horse hair for added strength. Lime wash, which is slaked lime of paint consistency, is a very effective wall covering and can be coloured by the use of pigments. It is still used as paint, although only for specialist applications. In the quicklime manufacturing industry the word ‘lime’ is used to mean quicklime, CaO. The word ‘lime’ is also used in the building trade to mean hydrated lime, Ca(OH)2. Unfortunately you have to interpret what is meant by ‘lime’ from the context. It is important to get it right, because quicklime is very much more hazardous than hydrated lime. Except in the expression ‘lime kiln’, the word quicklime will not be abbreviated to ‘lime’ in this account. The earliest kilns produced quicklime in batches, in what is described as a clamp or sow kiln. A shallow bowl was scooped out of a bank, open at the front, and with a flue, rather like an upside down igloo. A grid was added near the base on which to start the fire, with kindling, then alternate layers of coal (or other fuel) and limestone were stacked, at a ratio of 1:4 or 1: 5. The kiln was covered with turf or clay, and left to cook. Eventually, the whole thing was broken apart to recover the lime. 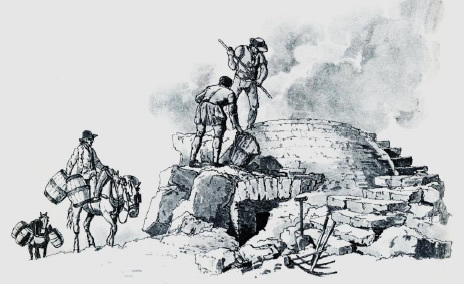 A similar principle was used for smelting lead ore in a ‘bole’, which was usually located on a hill top in order to maximise the available draft. A field kiln, like that shown in Figure 1, would also have been operated on a batch basis. Alternate layers of limestone and fuel would have been stacked in the kiln and the fuel set alight. After about 60 hours the quicklime would be removed from the base of the kiln. It is likely that succeeding batches were produced one after another because it would waste fuel to fire the kiln from cold each time. Most of the quicklime produced from these early kilns was consumed locally. 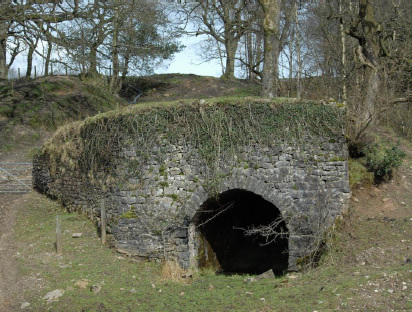 David Johnson, in his book on Limestone Industries of the Yorkshire Dales, describes how he has identified kilns of this type in the Craven area built between 1440 and 1700. (For details of this and other references see Chapter 5). Field kilns are semi-permanent structures made entirely of stone. Field kilns, in a simple form, appeared in the north of England in the seventeenth century. Only in the mid to late nineteenth century did this design go out of use. Some may have been operated on a continuous basis, with new layers of limestone and fuel being added to the top as quicklime was withdrawn from the base. It is difficult to assess the fuel efficiency of early kilns; a reasonable estimate would be that more than 250 kg of coal were required to produce 1000 kg of quicklime. The inner shell of a field kiln was a separate construction from the outer ‘visible’ structure. This design improved insulation and reduced the opportunity for rain water ingress, which could have had disastrous consequences. Fig 4: The well-preserved base of a field kiln near Cow Ark, probably of an early 19th century date. Like many such kilns, it was built into a slope so that the limestone could be transported downhill en route to the kiln. The arrangements at Shedden Clough near Burnley were unusual because of the source of the limestone, but they are of special interest and will be described in some detail. 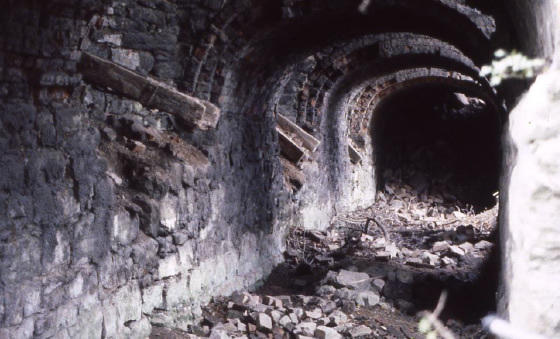 In Shedden Clough are the remains of a large number of relatively primitive kilns. Kilns of various designs were operated over a period of hundreds of years. That is not to say that any of these kilns operated for more than a few months per year; some may have operated for one summer only. Local resident and historian Titus Thornber spent a great deal of time documenting the kilns in this locality; his work is preserved in the local history section of Burnley Public Library. At first sight, Shedden Clough is a very unlikely location for lime kilns. There is no bedrock exposure of limestone within many miles, so the limestone could not be won by conventional quarrying. At Shedden, a deposit of boulder clay (properly described as ‘till’) contains boulders of Carboniferous limestone. Moving ice sheets plucked boulders of limestone from upper Ribblesdale and the Yorkshire dales, transported them within the ice to Shedden and deposited them there as the ice sheet retreated between about 10,000 years ago. Separating boulders of limestone from the till must have involved considerable effort as they were separated by a process described as ‘hushing’. Between Shedden and Skipton there were at least twenty localities where hushing was carried out. Hushing is the process in which a reservoir of water is held back by a dam at the top of a slope; then the ground surface below the dam is broken up with picks and shovels and the dam broken. Whoosh! The resulting surge of water entrains the loose surface material and washes it down the slope. This process was not confined to Shedden. At Roughton Gill, near Caldbeck in the Lake District, the process was extensively used for exposing veins of mineral ore in the valley sides. It was also widely used in Swaledale in the lead mining industry there. At Shedden each boulder would have been coated with boulder clay and may have had to be at least partly washed to identify whether it was limestone or not. The limestone boulders would have had to be broken up into pieces between about 75 and 150mm across and the smaller sizes discarded, the reasons for which will be explained later. The Burnley Geological Memoir describes a four feet thick (1.2m) seam of the ‘Gannister Coal’ cropping out in Shedden Clough so, although limestone extraction was not straightforward, a fuel supply was available close by. In 1978 a new coal mining adit broke into the old coal workings where coal had been extracted for lime burning. Titus Thornber produced a detailed map of Shedden Clough, incorporating hushes, limekilns and pack horse tracks. The increase in building activity associated with the industrial revolution would have provided a local market for quicklime and it seems likely that a large amount of money was made, at least by the landowners. Thornber’s map is reproduced in Figure 5 below. The next step in the evolution of lime burning technology was the development of the ‘industrial’ kiln, with its output destined for a wider market. Figure 6 shows the principles of operation of a continuous-operation lime kiln. Modern versions are described as shaft kilns. The diagram shows the kiln being loaded from ‘jubilee’ wagons but obviously earlier kilns, of similar shape, would have been fed with less mechanical assistance. In later more efficient designs the fuel would be fed directly into the hottest part of the kiln and limestone alone would be fed to the top. 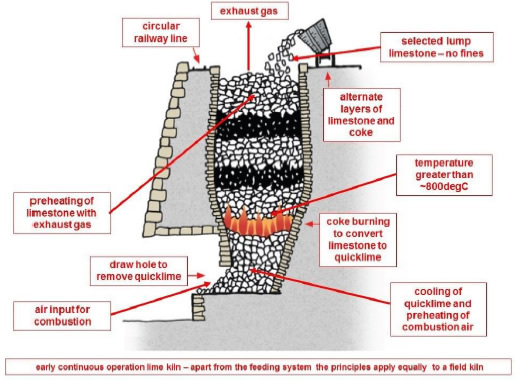 Fig 6: Principles of operation of a continuous process lime kiln. Relatively early kilns would be filled with alternate layers of fuel and limestone as shown here. In this diagram the fuel is described as coke; coal, wood and charcoal were also used. The great benefit of the design of an industrial kiln was the considerable improvement in fuel efficiency. Air for combustion was preheated, by passing through the quicklime en route to the hottest part of the kiln, with the additional benefit of cooling the quicklime at the same time. Exhaust gas from combustion also dried and preheated the limestone. Industrial scale shaft lime kilns were certainly in operation by the mid nineteenth century. 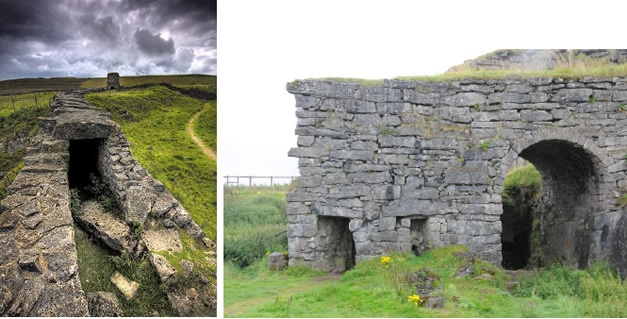 The bank of kilns shown in Figures 7 to 9 is located near Bellman Quarry, Clitheroe. The kilns are on privately owned land. There is no safe access and the structure may not be entirely sound. The kilns were probably built very soon after the completion of the railway in 1850. Fig 8: Photograph of the Bellman lime kilns in operation. The long bridge-like structure supported an endless chain conveyor which carried limestone and fuel to the top of the bank of kilns (which is to the left of the chimney). 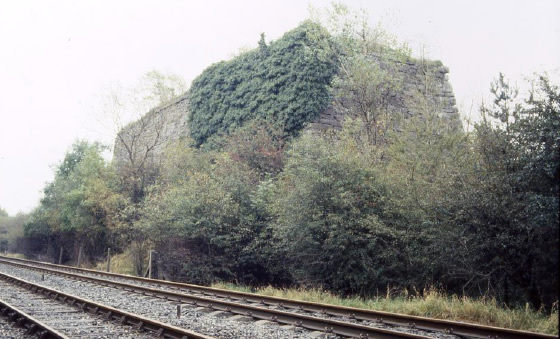 The Bellman lime kilns, like many others, were strategically placed so that quicklime could be loaded directly into full sized railway wagons. In the early design of continuous-process kilns the fuel was put into the top with the limestone. This may not have mattered much if the fuel was coke, but it did not make good use of coal. Coal typically contains between 20 and 30% by weight of volatile matter, consisting of methane and other combustible gases. Because the coal was heated slowly the volatile matter was evaporated before the temperature was high enough for it to burn. Consequently much of the heat value of the coal was wasted. In 1802 Romford invented a kiln where the fuel was introduced into the hottest part of the kiln (the calcining zone). After the mid nineteenth century most designs incorporated fuel chutes into the hottest part of the kiln, as shown in Figure 10. Most kilns of this design were of quite small diameter because of the difficulty of introducing coal into the centre of the kiln. 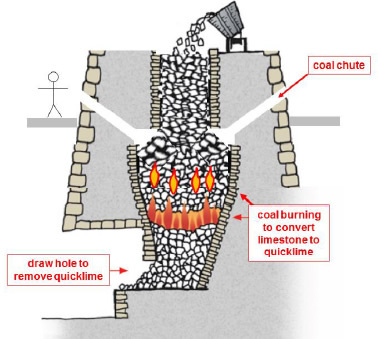 Fig 10: Diagrammatic representation of a lime kiln with coal chutes, designed to introduce coal into the calcining zone of the kiln and therefore to make more efficient use of the coal. All modern kilns operate on this principle or something very similar. Figure 10 is a picture of a lime kiln at Slite, on the Swedish island of Gotland. Note that the ports for fuel input lead into the calcining zone, quite low down in the kiln. Fig 11: Kiln with separate coal chute (the square hole) in the calcining zone. The quicklime draw arch is at the base. The limestone feed conveyor has been removed. 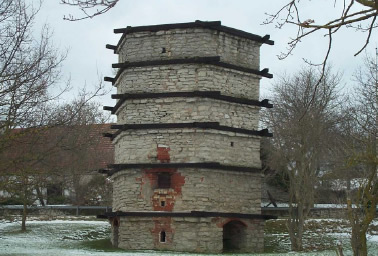 This kiln is located at Slite on the island of Gotland in the Baltic Sea. The motive power for drawing air and gas through the kiln was initially provided by convection, sometimes supported in earlier designs by orientation of the quicklime withdrawal arch towards the prevailing wind. In modern kilns the motive power comes from an induced draught fan whose suction side is connected to the top of the kiln. Then, of course, a gas tight seal is required at the limestone feed point. In older kilns a chimney was sometimes used to maximise the benefit from convection. 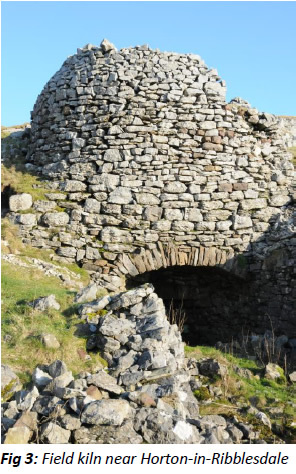 Figure 12 shows such a kiln, located at Toft Gate near Greenhow in north Yorkshire. The chimney is on higher ground, joined to the lime kiln by a flue. In these kilns gas flow control was achieved by restricting the fresh air input to the kiln at the quicklime withdrawal arch. (left) The remains of the chimney stack at Toft Gate and, in the near ground, the flue from the lime kiln to the stack. (right) Toft Gate kiln with coal feeding ports at ground level. The quicklime withdrawal arch is lower down at the back. The start of the flue is just visible on the right. Except when limestone was being loaded to the kiln an iron plate, or something similar, was used to seal the top of the kiln. Fig 13: A view inside the Toft Gate kiln. The rectangular coal feed ports can clearly be seen and the distorted lining shows the impact of high temperatures inside the kiln. 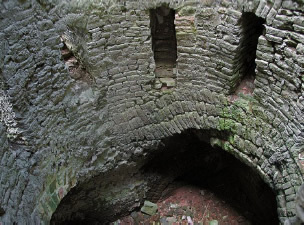 Figure 13 shows the inside of the Toft Gate kiln, showing high temperature damage. Even today, refractory linings of lime kilns require regular replacement. A successful advance was made by Hoffmann, who invented a ring shaped (annular) kiln. Variants of this design are still used today for brick manufacture. In principle the Hoffmann kiln is a vertical shaft kiln placed on its side, with the three zones of (i) limestone preheating, (ii) conversion to quicklime (calcining) and (iii) quicklime cooling, located horizontally inside an annular tunnel. Although it was efficient, it was very labour intensive because the stone had to be stacked by hand and the quicklime removed in the same way. Figure 14: Plan view of Hoffmann kiln showing principle of operation`. The zones are located inside an annular tunnel. The exhaust gases leave via a chimney located above the central blue arrows on the diagram. Consider the kiln in normal operation, as shown in Figure 14, sketch 1. All the arched access doors (wickets) between positions B and A are bricked up and sealed. One steel door near to the tunnel seal at position A is open and provides a route for exhaust gas to pass into the flue gas duct. All other steel doors around the whole kiln tunnel are closed so that gas is only drawn through the successive quicklime cooling, calcining and limestone preheating zones and ultimately up the chimney stack. For that reason the tunnel seal at position A is a vitally important gas tight seal. The seal at A is made of paper, possibly in the form of papier mache. While operating in the condition shown in sketch 1 new stone lumps are piled up to fill the tunnel between position A and A1. The tunnel must be filled completely or the gas will pass around the pile of stone instead of through it. To avoid too much gas passing through the material near the top of the tunnel and too little lower down (because hot air rises) there are small apertures near the base of the stone pile and parallel to the tunnel, along which hot gas encounters reduced flow resistance. When the stone in the red zone has been converted to quicklime, the operation is ready to move one chamber clockwise to the condition shown in Figure 14 sketch 2. A new paper seal is fitted at position A1 and the arched access doors between A and A1 are bricked up and sealed. The steel door to the flue gas duct near A1 is opened and that near to A closed. The old seal at position A would normally burn away, but if necessary was ripped out. The whole ‘lime burning’ operation that previously took place between B and A has now moved one step clockwise. The final action is to open the side door near to position B1 for fresh air input. The access doors between B and B1 are then opened up and the relatively cool quicklime located between points B and B1 is removed by hand without any influence on kiln operation. For ease of explanation the three zones have been shown to be the same length. In practice each zone would consist of several chambers, especially the preheating zone which would probably be twice as long as the other two zones. 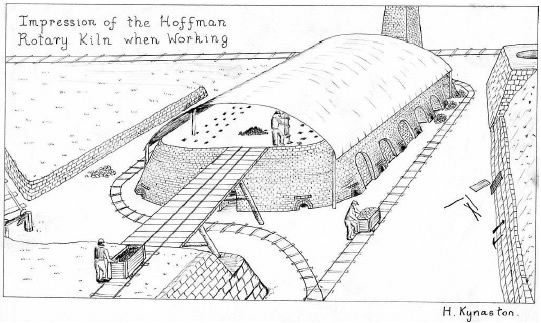 Some descriptions of Hoffmann lime kilns say that the tunnel seal in sketch 1 position A was made from steel plate. This would have been temporarily replaced with paper while this metal seal was removed and relocated in position A1, prior to the flue gas duct door being opened at A1 and closed at A. I have read the working instructions for a brick making Hoffmann kiln and mention was made only of paper seals. It is possible that the exhaust gas temperature was higher in a lime kiln. Clearly use of metal tunnel seal would have been more challenging and more labour intensive, but the principles of operation described above would be the same. In large kilns the active part of the process occupied rather less than half the length of the annular tunnel. Two separate lime burning operations could then be operated at the same time, 180O apart. Much maintenance could be carried out in the ‘empty’ section without interfering with kiln operation, so these kilns could operate for a very long time without stopping. The Langcliffe kiln was longer than this but the overall appearance would have been similar. The coal would have been transported by small railway wagons onto the upper floor level, from which it was fed via chutes into that part of the annular tunnel where calcination was taking place. 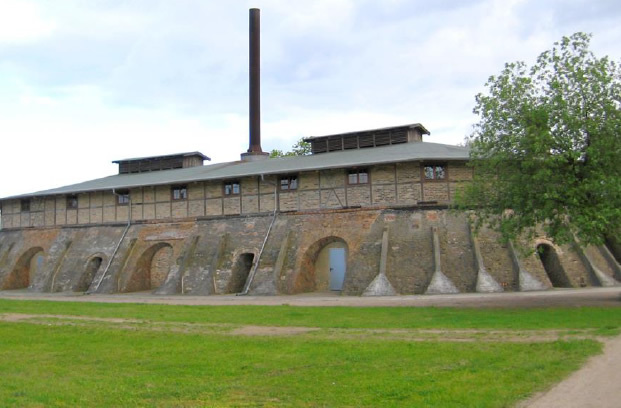 Fig 15: Hoffman continuous kiln in the brickyard museum at Zehdenick. Photograph courtesy of Schlesinger. Figure 16 is a photograph taken in the straight tunnel at one side of the kiln at Langcliffe. Unless you visit a Hoffmann kiln its size is difficult to imagine, but you can get some idea from the apparent size of the person at the end of the tunnel. 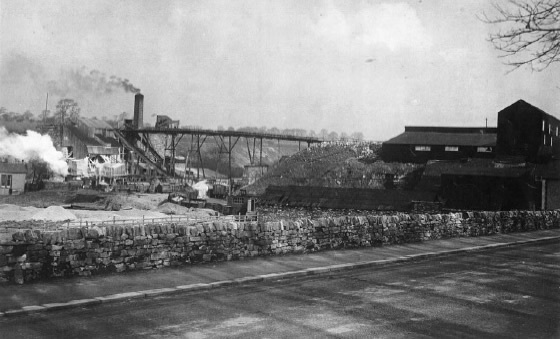 Figure 18 is a picture of the Hoffmann kiln, now demolished, at Harpur Hill Buxton. The picture has been used by agreement with ‘Picture the Past’, www.picturethepast.org.uk, with acknowledgements to Derbyshire County Council Environmental Services. 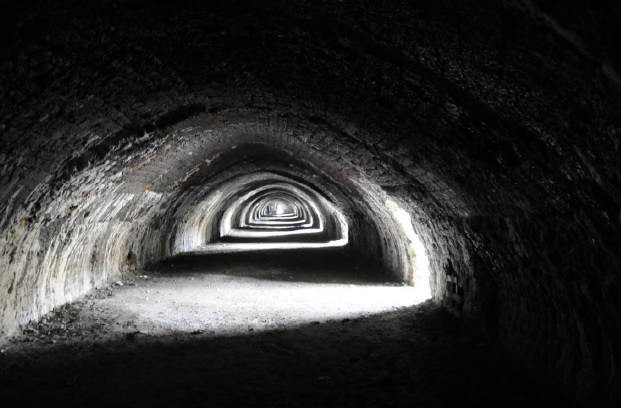 Fig 16: View down the tunnel on one side of the Hoffmann kiln at Langcliffe, near Settle. For scale note the person with a blue anorak standing on the left at the far end of the straight section of tunnel. The complete annular tunnel consists of two straight sections, like the one shown, joined at both ends by two semi-circular tunnels of the same size, to close the loop. 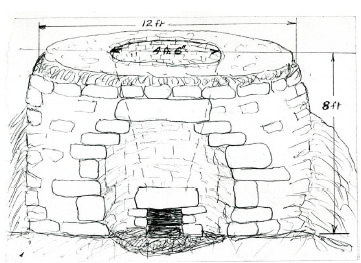 Fig 17: Diagram of a Warren kiln, a derivative of the Hoffmann, drawn by H Kynaston, courtesy of the Llanymynech Community Project. 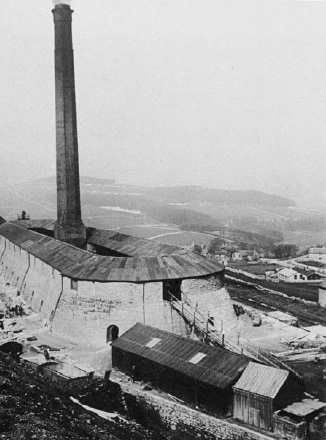 Fig 18: Hoffmann kiln at Harpur Hill, Buxton, courtesy of ‘Picture the Past’. This kiln has now been demolished. It is reported (Leach) that the kiln was lit in 1872 and the fire never went out until 1944 when the kiln went out of use. Today most lime kilns consist of one or more vertical steel tubes, lined with refractory brick. They are always fitted with induced draught fans to optimise gas flow through the kiln and maximise production. They operate on a similar principle to that shown in Fig 10. 4 Critical success factors in the manufacture of quicklime. Much has to be ‘done right’ to make good quality quicklime. Today, manufacture is controlled with the aid of a deeper scientific understanding of the process and high quality instrumentation. In earlier times the quality of the quicklime depended on the skill and experience of the ‘lime burner’. The first important parameter is temperature or, more correctly, the combination of temperature and residence time. Certainly a temperature of between 800 and 900⁰C is a primary requirement and the residence time must be sufficient for that temperature to be reached in the centre of each lump of limestone feed-rock. If the correct time temperature relationship is achieved, the lumps of quicklime will be about the same size as the feed-rock and the quicklime produced will be highly reactive. In modern production facilities quicklime reactivity is measured by dropping a prescribed weight of quicklime into a known volume of water and monitoring the temperature rise. In the old days it would have been sufficient to drop a lump of quicklime into water; the violent reaction would have been easy to see, with much fizzing and even local boiling of the water. If limestone is heated to too high a temperature for too long the lumps of quicklime become compacted and the resulting dense quicklime is described as ‘dead burnt’. If you drop a lump of dead burnt quicklime into water, no sign of a reaction can be seen. For most applications dead burnt quicklime is of little use. The particle size distribution of the limestone feed is important. Modern vertical kilns used for the production of quicklime are fed with limestone lumps that typically would be small enough to pass through a sieve with a 100mm square mesh and large enough not to pass through a 50mm square one. The two to one ratio of stone size has historically been a ‘golden rule’ in the industry. 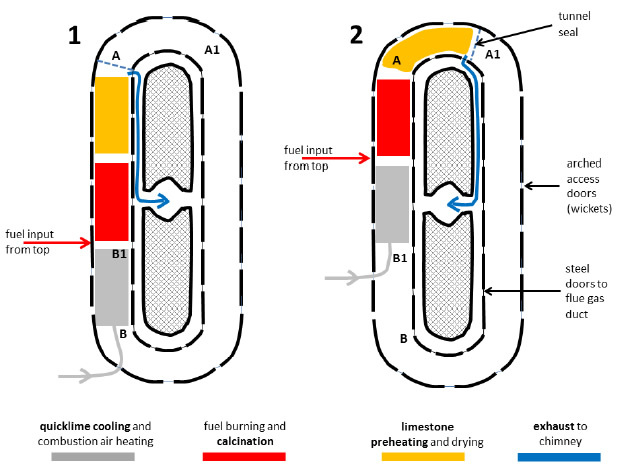 In the kiln, the air for combustion and the resulting exhaust gases have to pass between the lumps of limestone and this stone size range provides sufficient gas permeability, as shown in Figure 19. Insufficient gas flow, insufficient air for combustion, insufficient heat, insufficient temperature, no quicklime! 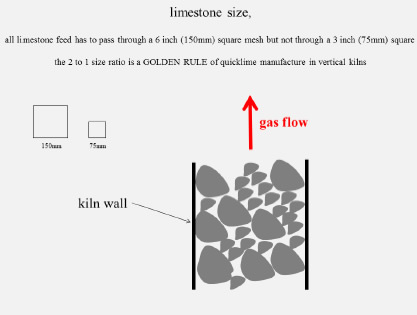 Fig 19: Two to one ratio limestone feed size, showing space for gas flow between the lumps of limestone. Limestone feed size between 150 and 75mm would have been normal for pre 20th century kilns designs. The centre of a lump of limestone that is too large is not fully converted into quicklime in the kiln. A lump of quicklime withdrawn from the kiln but retaining a limestone core is known as a ‘bullhead’. Even in the 1980s the author can remember bullheads being removed by operators ‘picking’ from a moving rubber belt conveyor which transported quicklime from kiln to storage. Removal of bullheads improved the quality of the quicklime despatched to customers. For kilns that were loaded with alternate layers of limestone and fuel, the particle size range of the fuel was also important. Physically robust fuels such as coke presented no problems, but fine grained coal, peat and bracken were also used. I can find no reference to the methods employed to use these more difficult fuels. Perhaps each layer of fuel, rather than being spread across the whole cross section of the kiln, was placed in a number of discrete heaps. Sufficient permeability would then be maintained through the areas between the heaps. Wood was also used as a fuel; this would almost certainly have presented fewer problems; the moisture content of the wood, up to about 40%, would have been reduced in the preheating zone. High ash fuels would be avoided if possible because the ash was likely to fuse and stick the lumps of quicklime together, causing blockages near the outlet from the kiln. Most lime burners would have had little choice; they would just have had to use what fuel was available and learn to deal with the consequences. If a limestone quarry is operated solely to produce limestone feedstock for lime kilns, a high proportion of quarried rock will be in the wrong size range. The waste may be as much as 30% so, for economic reasons, other uses are normally found for the remainder of the quarried material. The quality of limestone is a key to the manufacture of quicklime and high purity limestone is preferred. If the limestone is dark coloured because of a high organic carbon content, this may save fuel and therefore be beneficial. However, if the limestone is dark coloured because it contains silica rich impurities of mudstone (or shale), problems are likely to arise. The raw material for Roman cement is a mixture of mudstone, which is a source of silica, and limestone. At a temperature much the same as that needed for lime burning, silica in the mudstone and quicklime combine to form an anhydrous calcium silicate. Anhydrous calcium silicates of slightly different composition are the principal strength-forming minerals in today’s cement. Anhydrous calcium silicates undergo a chemical reaction with water and set hard. Roman cement is not quicklime but may be considered a relative of today’s Portland cement. The cost of supply of quicklime to customers includes manufacture and transport. Prior to canals and railways, pack horses would have been the principal means of transport. 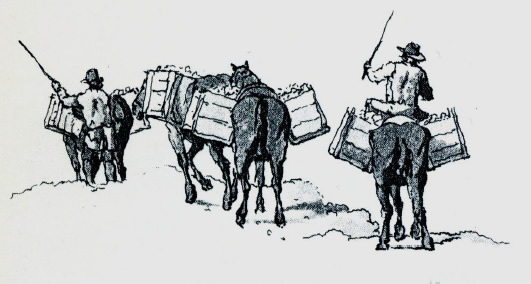 Quicklime was carried in sacks or boxes slung across the backs of the pack horses, see Figure 20. The animals used were donkeys and small Galloway ponies, known as lime-gals. A good supply of limestone near Clitheroe resulted in the construction of large numbers of lime kilns. In 1773 between 500 and 1000 packhorse loads of quicklime per day passed through the town. Quicklime was carried because the addition of water, to convert it to hydrated lime, would have increased the load on the pack horses. However, if water penetrated into the quicklime, the boxes or sacks would set on fire; an alarming experience for the pack horse! Quicklime mixed with just enough water to break down into a dry powder is known as hydrated lime. If more water is added the quicklime is described as slaked. Historically, for use inside buildings, the quicklime was slaked sufficiently to make a paste, known as lime putty, of the consistency of whipped cream. Clearly that portion of quicklime which was dead burnt (overcooked) would take a long time to hydrate. In the recipe for wattle and daub the proportions used were 4 to 1.5 to 1, lime putty to sharp sand to cow dung with finely chopped straw, horse hair or sheep’s wool added as a binder. Thorough mixing was required either by use of a pug mill or by treading, chopping and treading again for at least 30 minutes. A finishing coat without the fibrous binder was applied for the final finish and pigment (such as pig’s blood to give a pink colour or ochre to give various yellow/orange shades) could be mixed with this coat. Lime plaster, which is how the finishing coat would normally be described, was used in Anatolia in about 7000 BC. From the time of the first Greek civilisation its use was commonplace. It is possible that the use of lime putty mixed with sand and/or coal ash and/or volcanic ash was established before 2000BC. This mixture would have properties similar to Roman cement. It is known, however, that the Egyptians used gypsum for ‘mortar’ in the pyramids, perhaps because this was a locally available material. In the early 16th century it was discovered that quicklime could be used to ‘improve’ acid peaty ground to allow grass to be grown for sheep grazing. Slaked lime was widely used and many small clamp kilns were built, many of them producing a batch of quicklime only a few times a year. The fuels used included wood, bracken and peat, so the quicklime quality was probably poor. Limestone could be used instead of quicklime but only if ground very finely. Ground limestone is very much slower acting but is used today as it is cheaper than quicklime. ISBN 978-1-4456-0060-4. David has also contributed by making helpful suggestions on improvements to an earlier draft. Pyne W.H., 1806. Microcosm (a series of etchings of life at that time). Titus Thornber. 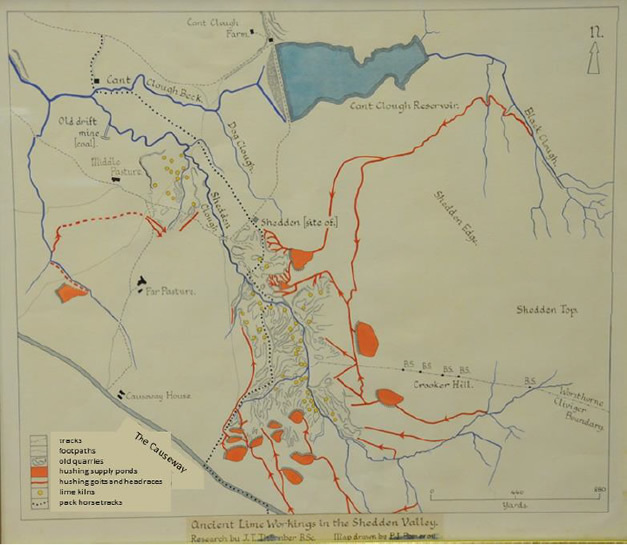 Various notes and a map of Shedden Clough, all kept in Burnley Public Library local history section. © 2019 GeoLancashire. All rights reserved.